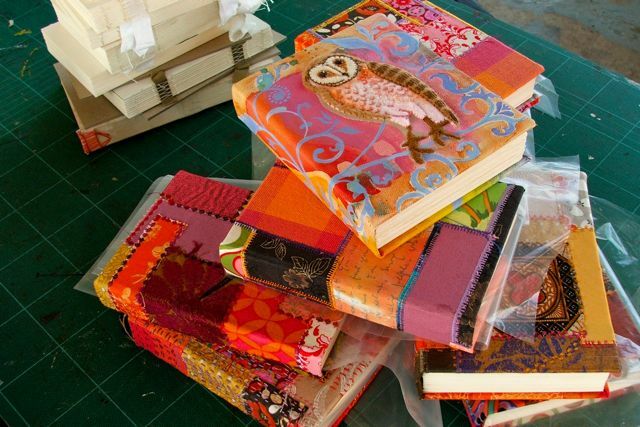 Started the day with a small pile of text blocks (stitched, taped, glued yesterday) and 8 pieces of machine-stitched crazy patchwork. There’s a craft market on the grounds of the NT Museum and Crafts Council this Sunday, and I wanted to offer something new for the Dry Season. 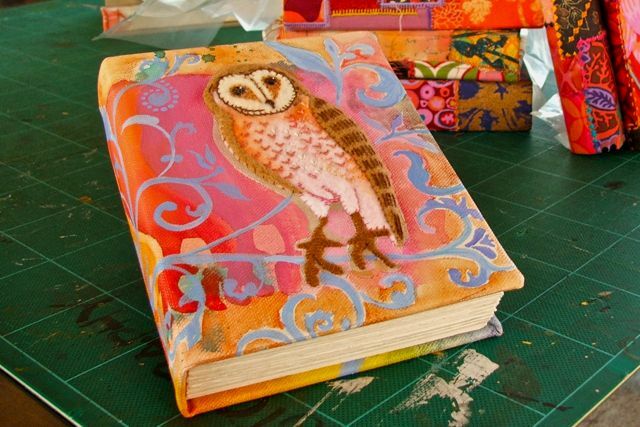 Also, I finished Danielle’s barn owl journal. It needed something, so I painted some curly tendrils and leaves over the rainbow of owl silhouettes. What do you think? I hope D. likes it, anyway. Towards lunchtime Kris went over to the mangroves and pulled up our crab trap (sometimes—not very often—we take the time to bait and set out a trap for the mudcrabs in this area). 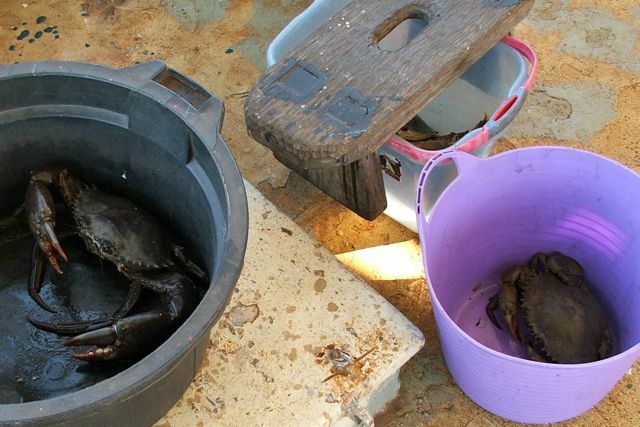 He came home with three monstrous crabs…all in our one trap! Yay! The timing was perfect, as Kris sets sail tomorrow morning for the Philippines, so we were going to have a memorable last dinner together (and for the four months that he’ll be gone there is no way that I am going crabbing myself!) They were big. And man, they were angry! Not that I blame them. *shaking head* Honestly! Throwing away the crab’s rich fat…or removing the beautiful heads of large fish…or boiling wonderful big prawns in plain water, and then chilling them on ice, and eating them between slices of horrible white bread, with cold butter, and lettuce leaves. Blarggghhh! No wonder England has had to adopt vindaloo as its national dish. Blend the first three ingredients in a food processor (or with a mortar and pestle) to make the spice paste. Add a little oil to make it smooth. Mix the last four ingredients together (not counting the coriander garnish), to make the sauce. Heat a wok in high heat until smoking hot. Add the oil. Stirfry the pieces of crab until the shells change color (2 minutes or so). Remove and set aside, turning the stove down to medium. Stirfry the blended spice paste for a minute or two. Add the sauce mixture to the wok and stir well. Put the crab pieces back in, and simmer for three minutes, adding a sprinkle of water now and then if the sauce gets too thick. Hint: If you don’t want to cook a frozen or long-dead crab (inferior, even unacceptable, to Asian cooks…and don’t even think about those plastic trays of white and orange ‘crab meat’! They’re made of fish.) put your live crabs on top of lots of ice in a cooler for at least an hour. They will turn catatonic and very placid, but won’t die. When you’re ready to cook them, you can pick them up easily, they won’t put up a fight. Take extreme care if you are going to pick up an angry, alert mud crab with your bare hands…they may look small, but those pincers will crush the bones in your hand. As I was moving these monsters into the cooler, I used a wooden spoon to push them out of their buckets. The smallest of the three grabbed my wooden spoon and cracked it. I love the book covers!! 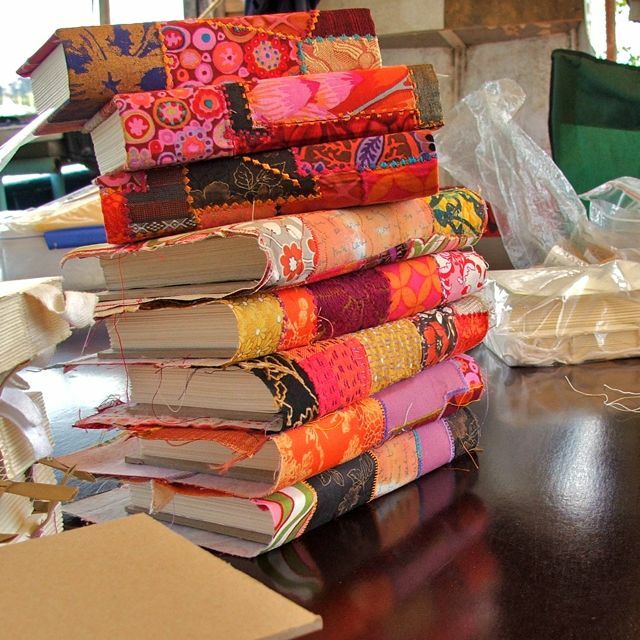 Your post makes me want to cover every book I have like that! Dining like a king and queen!!! 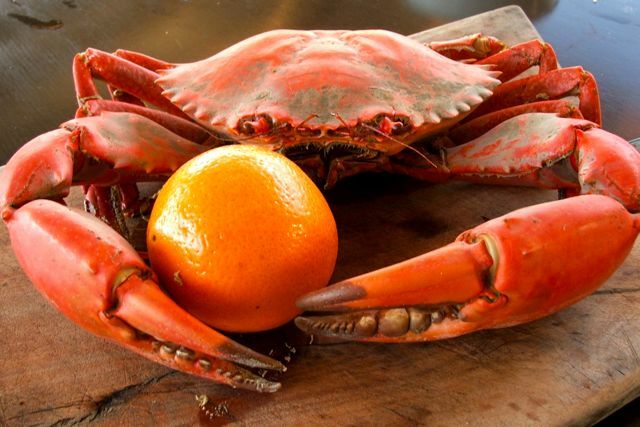 I really love that photo of the crab with the orange. Oh! I agree with Anne – but I would prefer to have you in my house (with the chilli crab too)! the book covers are really amazing! What do I think? I think the journal looks INCREDIBLE!!! I love the painted details and how well they work with the fabric. That is just a beautiful piece of artwork and I wish I had one in my house. 😀 Thanks for sharing! 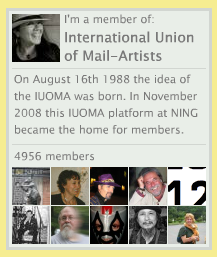 Oh, thank you, Anne! I’m glad it works, then. It’s just pieces of felt on painted canvas…you could have on in your house, easy! 😀 Thank you for the two-thumbs-up comment!